It took England until the seventh and final ODI to beat Australia last year; nine months later, Eoin Morgan produced his best one-day international innings to ensure they would start the series on a high. Morgan's unbeaten 103 was the standout performance of the match, more authoritative than Michael Clarke's anchoring role for Australia, and it was enough to separate two sides that otherwise mirrored each other. Before this game, Morgan had passed 80 on five occasions in ODIs, but those efforts had come against Bangladesh, Canada, Scotland or Netherlands. Triple figures against Australia is another thing entirely. He drove England home with four overs to spare, by which time the only real point of interest was whether he had enough runs to play with to reach his hundred. He did it with the final stroke of the match, a lovely straight drive for four that brought a victory and a century. 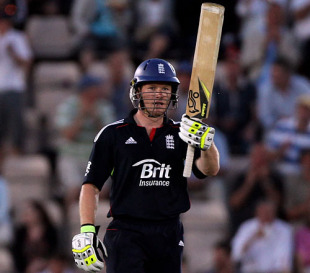 It was a wonderful innings from Morgan, who could do no wrong. He struck 16 boundaries and they came all around the ground, with drives, cuts, pulls, reverse sweeps, glances - all perfectly placed. No other batsman throughout the day found similar touch. At the halfway point of Australia's innings they were 112 for 4; after 25 overs of England's chase the score was 115 for 4. All of Australia's specialists reached double figures, as did their England counterparts, but only one man from each side turned his start into a half-century. For Australia, that was a sedate but admirable 87 from Clarke; for England, it was a powerful, matchwinning hundred from Morgan. He proved a handful for Australia's attack, which always threatened to be the weak link in their line-up. Doug Bollinger had played 21 previous ODIs, Ryan Harris had figured in 13, and the 19-year-old Josh Hazlewood was on debut. None had played international cricket in England, and only Harris was sharp from the start. Bollinger found no swing and bowled too straight, and Hazlewood began nervously. Somehow, with a couple of wickets from Shane Watson, England were temporarily kept in check. Harris gave them an early breakthrough when he angled one across Andrew Strauss, who edged behind, before Kevin Pietersen and Paul Collingwood fell trying to dominate Watson. Hazlewood, Australia's youngest ODI debutant, snared his first victim when he nipped one back to bowl the impressive Craig Kieswetter (38) with the first ball after the drinks break. Then came Morgan. He had some help from Luke Wright, whose 36 included a wonderful lofted six over long-on against Watson, but Morgan was the key. He kept the run-rate under control and made sure England would take a 1-0 lead to Cardiff. It was a result that didn't surprise some England observers, who felt Australia's side lacked experience. That was a bit of a myth; even leaving Ponting out of the count, Australia's remaining 10 players had a combined 670 games behind them, compared to 696 from England's full team. But Australia's veterans were all in the batting department, so on a good surface they were disappointed to post 267 for 7. The problem was a steady stream of wickets, two each to James Anderson, Stuart Broad and Wright, and one to Michael Yardy. Other than a brief early fling from Watson, Australia never dominated England's attack. Unlikely though it was, Wright was an important figure with the ball. Just as Australia's muscular blond allrounder Watson collected two handy wickets in England's top order, his doppelganger Wright did the same for the hosts. Tim Paine played on to Wright and Ricky Ponting couldn't lift his pull over the man at fine leg, before Cameron White was also surprised by Wright's pace and was struck by a sharp bouncer. It was left to Clarke to ensure Australia batted out their overs, and having made two ducks in the warm-up games it was to his credit that he achieved that goal. He put away boundaries at times - a straight drive here or a punch through cover there - but struggled to lift his rate in the dying overs, when Australia were hoping to push closer to 300. Notably, Clarke struck seven boundaries to Morgan's 16. Not that the loss was Clarke's fault; he just needed support. Morgan didn't need much backup from anyone.